As leaders, it is hard to measure how effectively the millions of people sitting in front of computers are working in our offices around the world. This lack of measurement would not be acceptable in call centres and factories, but is excused in the softer knowledge economy workplace. Now, big data analysis and AI can decipher what people are doing and actions can be taken to increase productivity, effectiveness and collaborations within companies and with customers and suppliers. Imagine we could apply the concept of big data analysis (as we know Amazon, Facebook and Google apply it to customers), to understand what all the employees in a company are doing. We could then target training, improving the performance of the weaker teams to the same level as the high performers, or re-engineer the way people work so they can work more effectively. Does that sound incredibly exciting as a leader, or incredibly frightening as an employee? Being tracked in such a way is exactly what factory or call centre workers have faced every hour of every day in their workplace for years…so this is nothing new. But the idea is revolutionary for office workers in our knowledge economy because there is a belief that the intangible nature of their work can’t be measured and the technology does not exist to do it. Productivity has remained flat since 2008. But this period has also experienced the biggest revolution in accessibility through digital, smart phones, apps and cloud data processing. In 1990 Microsoft Office launched, with email following in 2000. Both products revolutionised productivity. Since then, the data suggests that there hasn’t been much of a change. Perhaps subsequent innovation has meant that the latest revolution has spread the same work over many more hours. This would cancel out any gains in output to leave productivity flat. Our every move is being tracked by Facebook, Google, and Amazon Alexa. It’s also plain to see as they retarget us with ads, tailor the content we read and suggest the videos we’re most likely to watch. Luckily, the law is very strict on the privacy of personal data in the workplace. All of it has to be “anonymised and de-identified” as the studying is confined to how teams, functions and customers operate as a collective. What is more exciting is the new ability for empowered employees to use the data themselves to improve the way they manage both themselves and their teams. This is very true. The challenge with the new knowledge economy is that work is seldom as repetitive as in a factory. Quality, agility and depth of collaborations do differ between teams and people making it much harder to assess outputs. But big data analysis doesn’t measure the output per person. Rather it compares all the aspects of working between highly (and less) effective people and teams. The results of these differences are visible in the financial results of market leaders vs followers, agile companies vs slow ones and disruptors vs incumbents. So just because measurement may appear difficult or subtle does not mean it should be rejected completely as an important tool in leadership and management. The Office of National Statistics follows an international European standard for measuring productivity. It is the total gross margin produced by all companies in a country divided by the declared number of hours worked by a panel of 80k normalised workers across industries. 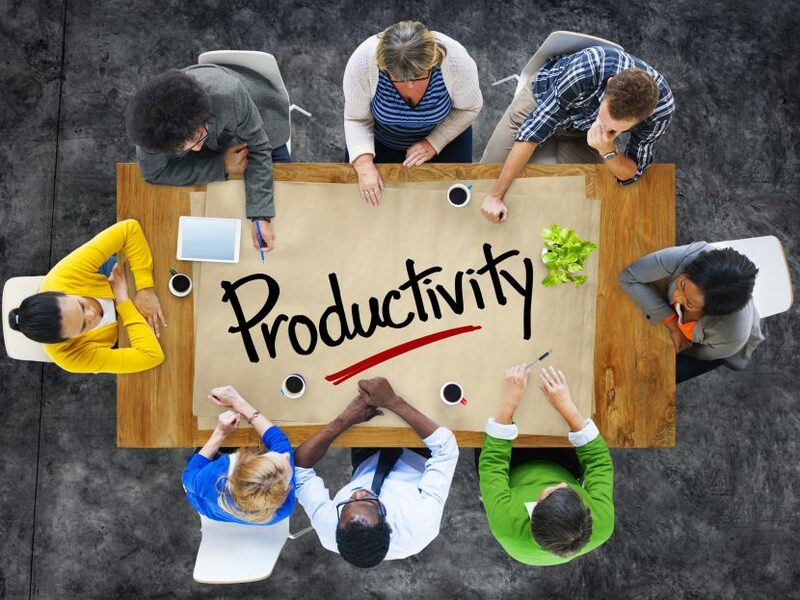 It is important to realise that productivity is not defined by how much is made, but the increase in gross profit. We can imagine therefore that in a low inflation, low-interest rate environment, it is hard to increase prices ahead of cost increases. So, gross margin growth depends upon reducing the costs to create an output, by having people increase the amount of output per person. Within the office working environment, it is tough to see what tools, or ways of working drive more output per person. The hours worked is a self-declared questionnaire relating to the hours worked in the last week. We can see how mobile, WIFI and the internet has led more of us to extend our working into the early mornings, evenings and holidays. Paradoxically this seems to flat line our productivity. Big data analysis can track every single email flowing around inside and to, and from external organisations. Since it is not about individuals, the system maps all the emails like rivers, streams and capillaries between people, functions and teams. It is the strength and the linkages of these email flows which tell the story about how people collaborate. Imagine this exciting idea: designing an organisational structure based on real live flows of emails rather than the simplistic and perhaps archaic ideas of functional reporting lines. You would sit people close together based on the amount of communication they have. At The Body Shop, we moved all the research and development people from a town on the south coast to near London so they would sit on the same tables as the Marketing teams compressing lines of communication, reducing misunderstanding and increasing agility. This can now happen systematically if leaders use big data analysis. Imagine, mapping the flow of emails of sales teams outside towards existing and potential customers, and the flows from the sales teams internally to subject matter experts. It is then possible with big data to see the correlations between the high and low performing sales teams and their levels and types of communication. What we learn is that salespeople who build extensive communication networks within their customers’ teams perform better than weaker communicators. Only big data analysis can provide this insight within our knowledge-based economies. Targeted coaching can then be applied to upskill the weaker sales teams. This can now happen. In this world of 24/7 connectivity, some organisations or departments may be driving employees to work heavily outside working hours. The benefits or lack thereof can be analysed at a flip of a switch, achieving a decisive result that aids the majority of employees in the company. With a simple application of big data analysis, we can already see how the lives of employees can be improved and that’s without considering what could be done about meetings. Meetings are infamous and with good reason. At once they are both necessary and the bane of many hard-working employees who are forced to spend too much time discussing action, rather than getting results. Of course, meetings can be the most efficient way to collaborate, share, cascade information and align people. But experience shows most are poorly run, rarely with an agenda, no clear lead and no one consistently filtering and taking actions. What’s more they are rarely summarised at the end, or at the start of the next meeting. No wonder everyone feels frustrated. Often, when people are confronted about their sense of meeting overload, they feel powerless to change the inertia of the company’s meeting attendance culture. With big data analysis, the management can break the paradigms and set a new cadence for people and meeting attendance. What can frustrate executive leadership teams is that their messages don’t always seem to cascade throughout the organisation and a game of Chinese whispers has to dilute it. Now the scheduling and cascade of direct report meetings following a Board meeting can be mapped which can ensure that messages are being rolled down the organisation in a timely and consistent manner. The power of big data analysis applied to the office is that correlations can be made with employee surveys to drive real improvements. Many companies suffer from high staff turnover, which would be reflected immediately in poor employee survey scores, but it can often be hard to understand the root cause of the disaffection. By running big data analysis on email flows, degrees of collaboration and meeting attendance it is possible to see how management in that behave differently to other areas – and for example don’t give enough support to one-on-ones, or demand too much meeting attendance, or communicate too much outside office hours. Now real cause and effect can be measured and illustrated leading to concrete actions being undertaken to improve the work environment. A tactical survey can be sent some months after, alongside the big data tracking of the changes to see how the sentiment has improved. One of the great outputs from big data analysis is that it can bring visibility to teams’ performance within the softer knowledge economy. It clearly shows that higher performing teams show more collaboration and networking than lesser performers. When this insight is applied to functions that are split into teams within functions such as sales, category, service, marketing, or human resources teams the mapping of the flows of emails from each team to the customers both internally and to expert functions can be correlated with actual sales or survey performance. We can now move from a semi nebulous sense of “these people get things done, or somehow gets the results” to “these people connected twice as often with customers, link into four-times as many people within the company” and so on. What’s Next for Internal Big Data Analysis? The software to undertake this big data analysis exists now and is used by some large pioneering companies. But it is quite expensive and the costs will need to come down so that it can be freely available to all employees. But as leaders, it is vital to embrace these tools, to lead better, to create better organisational designs and to drive productivity in partnership with data and the employees.